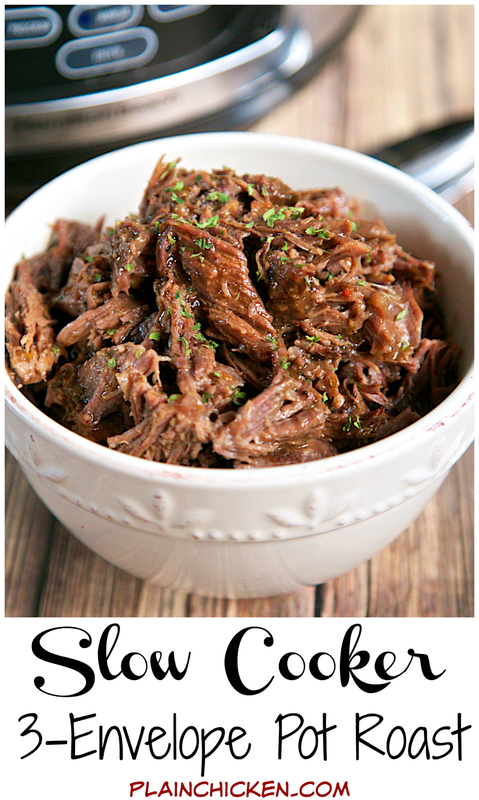 Slow Cooker 3-Envelope Pot Roast Recipe - pot roast slow cooked all day. So tender and delicious. Only takes seconds to prepare and dinner is ready when you get home from work! We served it with some yummy cheese grits. Rice or mashed potatoes would be good. Make sure to ladle the yummy sauce over it! 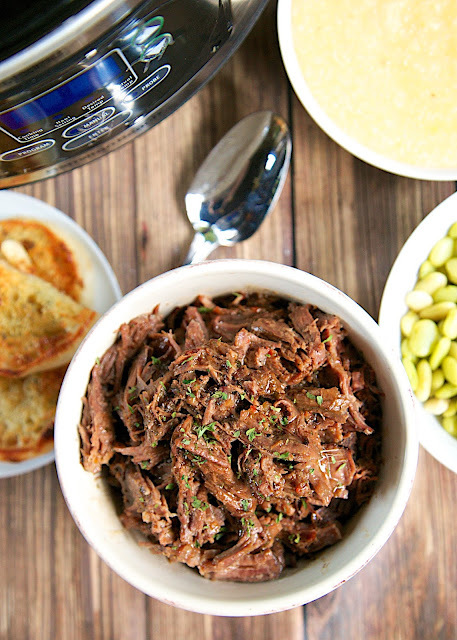 We love using our slow cooker year round. It is so convenient to throw everything in and have dinner ready without a lot of work! 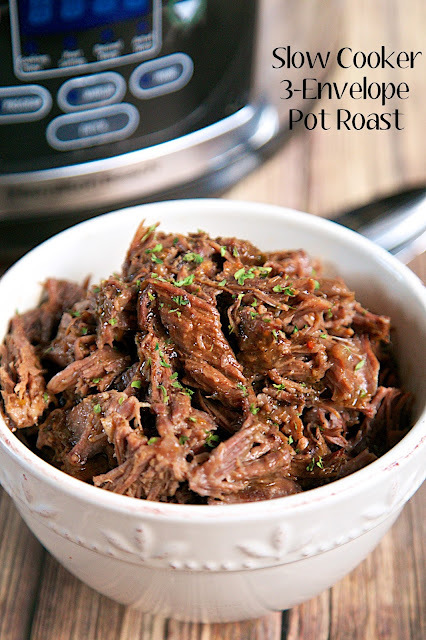 This Slow Cooker 3-Envelope Pot Roast was crazy easy. Literally dump everything in the slow cooker and walk away. Dinner was ready 8 to 10 hours later. I used a blade roast for this 3-Envelope Pot Roast. I also like to use Chuck Roasts for pot roast recipes. Both cuts of meat turn fall apart tender after slow cooking all day. We served this 3-Envelope Pot Roast with some peas and cheese grits. It was fabulous! It was even great reheated for lunch the next day! 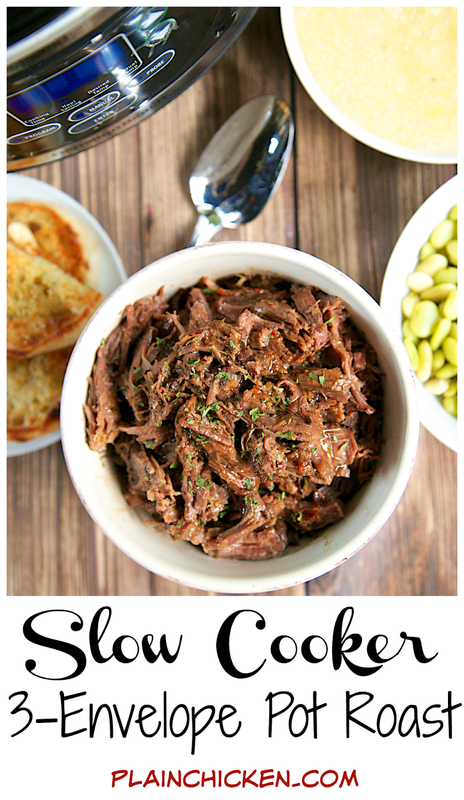 Place pot roast in slow cooker. Sprinkle with seasoning packets and pour 1/2 cup water over roast. Cover and cook on LOW for 8 to 10 hours. Shred and serve over cheese grits, noodles, rice or mashed potatoes. I do like this one better. I am not a fan of onion soup and cream of mushroom soup in a pot roast. I've made this before and we love it! However, I think it was with an AuJus packet instead of the Brown Gravy mix. In any case, I need to find something to use that is dairy free, due to food allergies in the family. I can get the Italian mix and the Ranch mix dairy free. Any recommendations for the third item? This is delicious. I also put carrots and potatoes in the crock pot and you have your whole meal! Yum! I have made this before also, but I add a cup of water, onions, carrots and potatoes.....yum yum!